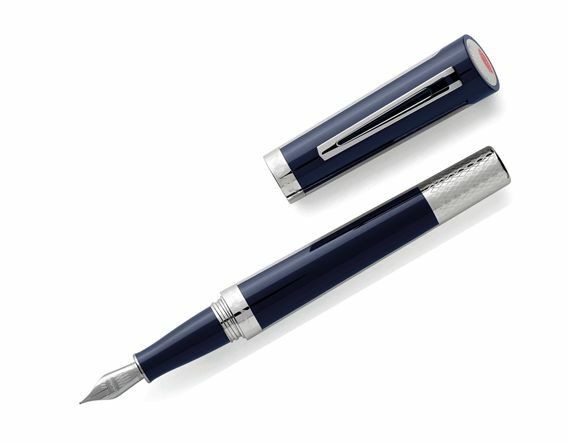 Order your Montegrappa Limited Edition Bugatti Pur Sang Fountain Pen today from FahrneysPens.com. Fine Pens, Refills & Luxurious Gifts – great prices & fast shipping. "Bugatti" - for many automobile enthusiasts, it is the most evocative name in the history of the motorcar. With decades of greatness on both road and track, throughout the 1920s and 1930s, and revived to its pre-eminence with the records-shattering Veyron in the 21st Century, it is a legend that spans generations, always aspirational, adventurous and innovative. Montegrappa, Northern Italian like Bugatti's founder Ettore, is delighted to announce a range of writing instruments redolent of this stellar marque. Montegrappa CEO Giuseppe Aquila says, "It is with immense pleasure that we are producing a line of accessories for Bugatti, like meeting old friends once more. Montegrappa had the privilege of creating pens during the era of the Type EB110, so it is doubly meaningful for us to renew a relationship with the famous marque of Molsheim." Inspired by the horses he loved, Ettore Bugatti invested his cars with visual clues to his equine passions. Most notably, his radiators - and the grille on the Veyron - were shaped like both a stirrup and a horse-shoe. He also employed the term "pur-sang", French for "thoroughbred", to describe his vehicles, imbued as they were with no-compromise engineering in the quest for the ultimate in handling and performance. It remains true to this day. In creating Bugatti Pur Sang Duotone writing instruments, Montegrappa studied the details and surfaces of the Veyron, inside and out. The cars themselves are often supplied in two-tone schemes, reflected in the series' name. Duotone pens' caps and barrels join metal components with superior-quality Italian resin. Starting on the cap and running through the complete pen, the metal surfaces are engraved with a pattern of "Dynamic Quilting", recalling the upholstery within a Veyron. The oval logo also appears in full color on the top of the cap of every pen, while the shape of the Veyron's headlights inspired the engraving around the cap ring. The fountain pen is fitted with an 18k gold nib, also engraved with the "Dynamic Quilting" pattern and featuring the famous Bugatti logo. All Bugatti Pur Sang Duotone pens are packaged in especially designed oval boxes to recall the marque's logo. The lid's inner surface features the "Dynamic Quilting" pattern, while the outer case suggests carbon fiber, as used extensively in the Veyron.